Minimum quantity for "Redesign of Three Multistory Buildings: A Comparison Using ATC-3-06 and 1982 UBC Design Provisions" is 1. Minimum quantity for "Tentative Provisions for the Development of Seismic Regulations for Buildings" is 1. 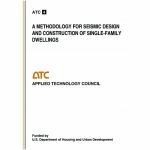 Minimum quantity for "A Methodology for Seismic Design and Construction of Single-Family Dwellings" is 1. 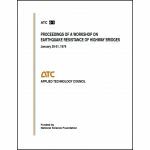 Minimum quantity for "Proceedings of a Workshop on Earthquake Resistance of Highway Bridges" is 1. 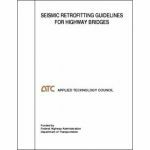 Minimum quantity for "Seismic Retrofitting Guidelines for Highway Bridges" is 1. 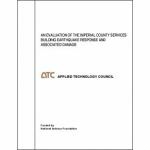 Minimum quantity for "An Evaluation of the Imperial County Services Building Earthquake Response and Associated Damage" is 1. Minimum quantity for "An Investigation of the Correlation Between Earthquake Ground Motion and Building Performance" is 1. Minimum quantity for "Critical Aspects of Earthquake Ground Motion and Building Damage Potential" is 1. Minimum quantity for "Seismic Resistance of Reinforced Concrete Shear Walls and Frame Joints: Implications of Recent Research for Design Engineers" is 1. 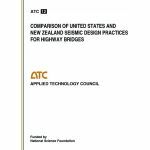 Minimum quantity for "Comparison of United States and New Zealand Seismic Design Practices for Highway Bridges" is 1. 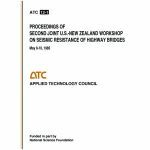 Minimum quantity for "Proceedings of 2nd Joint U.S.-New Zealand Workshop on Seismic Resistance of Highway Bridges" is 1. 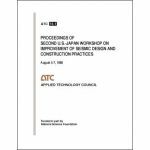 Minimum quantity for "Comparison of Seismic Design Practices in the United States and Japan" is 1.